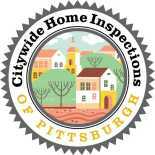 Citywide Home Inspections, Pittsburgh’s one-stop-shop for home inspections, radon testing and wood destroying pest inspections. We are locally owned and operated. John Fleenor is an ASHI Certified Inspector and conducts all the inspections personally. Our focus is on thoroughness and attention to the concerns of our clients. We carry a 28 foot ladder and get on every roof that is safe to climb. We do a thorough ASHI based inspection to give you the peace of mind that you are making an informed decision. The best report in the business. Reports delivered the day after the inspection. Call 7 days a week to schedule (412) 862-1443, email jthefleenor@gmail.com or click here to schedule on line.